It is fitting that today is the last day of 2016, and I just finished the quilt top of my 2016 Rainbow Scrap Challenge project, my scrappy 1920s Farmer's Wife. Before Christmas, I showed my rows partially completed, and I trimmed up the quilt top last night! At 67 x 88, it just barely fits into my kitchen. This is a pretty decent twin size, so I don't plan on adding a border. I don't know if I want to quilt this one myself or not, but my goal was to get the top done before the end of the year, and I accomplished that! Hooray! Last night I got the top trimmed and here it is "in the wild" aka on the dead grass of our apartment complex, which just has to do for the time being. I was pleasantly surprised by two things in putting this quilt top together. First, I was impressed with how well the colors end up blending from one another in the quilt. I think it helps that I didn't just do lines of each color - I tried to "interlock" each color with the next to make the color changes less abrupt. Second, I am wildly happy with how nicely all of the different prints, and styles of prints, are playing together. there are a few larger scale prints that stick out more than the rest, but overall, I don't find it to be too busy nor too gaudy. I think the simple grey setting is a huge factor in keeping it from being too much. Sharing at the last Scrap Happy Saturday of the year! Hopefully by next Saturday I'll have my plan for the RSC 2017! It's that time to get nostalgic about how fast the year has gone, what we accomplished, and what lies ahead! 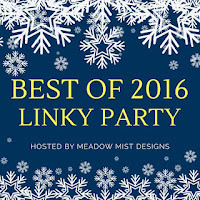 It also means that it's time for Meadow Mist Designs' annual Best of 2016 link-up! I've decided to share my five most popular posts (based on pageviews) but these are probably also my five favorite finished projects from this year! This is probably my favorite Moda Bake Shop project to date! This is my version of the 2014 Wishes quilt along from the Fat Quarter Shop! I love the bright colors on the dark grey background as well as the fun pieced backing. These were made for Benartex's Sew in Love with Fabric blog for two Christmas themed hops and I just love this fabric so much! This is my finished version of the 2015-2016 Meadow Mist Designs Midnight Mystery quilt. I love this color scheme, despite it being far out of my normal comfort zone! This is my finished 2015 Quilter's Choice Row Quilt, made with Allison Harris's Wallflowers Line. I love all of the different blocks and fabrics! You can get the pattern on Craftsy for free! Those are my five most popular/five favorite finishes from this year! 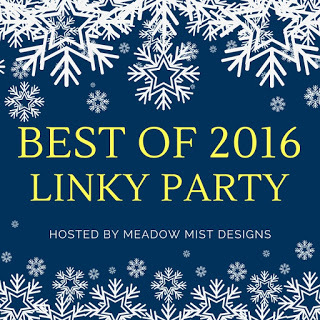 Hop on over to Meadow Mist Designs to see what other people have chosen as their favorites! The first thing I've been working on from my December WIP-busting list is my Farmer's Wife quilt that I have been working on as a part of the 2016 Rainbow Scrap Challenge. I decided to lay out my blocks in a rainbow ombre fashion (that's the best way that I can describe it!) starting with brown at the upper left corner, then progressing through orange, yellow, green, teal, blue, purple, red, and finally pink in the lower right corner. Originally, I had planned to use my neutral sashing and triangle fabric with cornerstones, but ultimately decided against it because it was going to be a lot more work. Sure, it would definitely look neat-o, but I think the blocks will "float" more without cornerstones. I decided to use 1 inch finished sashing for this quilt since the blocks are 6 inches finished. I worked on two rows at a time to get the blocks, sashing strips, and setting triangles into rows. My goal today is to get the top all together and figure out if it needs borders or not. Sharing at Scrap Happy Saturday! 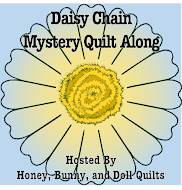 Yvonne of Quilting Jetgirl his hosting her annual new year goal setting party! I've decided to join in the fun this year. 1. Busting my WIP list. As I posted previously, I'm feeling very overwhelmed by my current number of works in progress (WIPs). I'd like to focus most of my efforts on finishing my WIPs this year, but I am not going to completely prohibit myself from starting a new project because I know there will be QALs that I will want to participate in next year as well as new projects I will "need" to start. So I'm going to implement a "three for one" system. Three completely finished projects off of the WIP list means I get to start a project of my choosing. My ultimate goal would be to get my WIP list under 10 by the end of the year, including any new projects I might start. This is going to be accomplished in conjunction with #1! 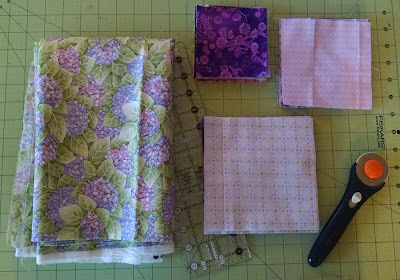 I have quite a few nearly-completed WIPs that are small enough for me to feel confident in quilting myself. I'd like to work on more filler motifs, but also work on more decorative FMQ as well. Between my own QAL, producing quilts for Moda Bake Shop, and tutorials for Benartex, I had 13 tutorials published which is a huge undertaking! Unfortunately last year a few of these were clustered very close together which was rather difficult, so I'd really like to spread these out a little bit more which should make the process more manageable. I loved participating in the RSC this year. I made a noticable dent in my scrap bins and I am so happy with my Farmer's Wife quilt! I am not planning to make 111 different blocks next year (thanks but no thanks!) and I think I might make all churn dashes. Maybe in different sizes, but maybe not. I definitely need something much simpler and potentially more versatile than the Farmer's Wife. 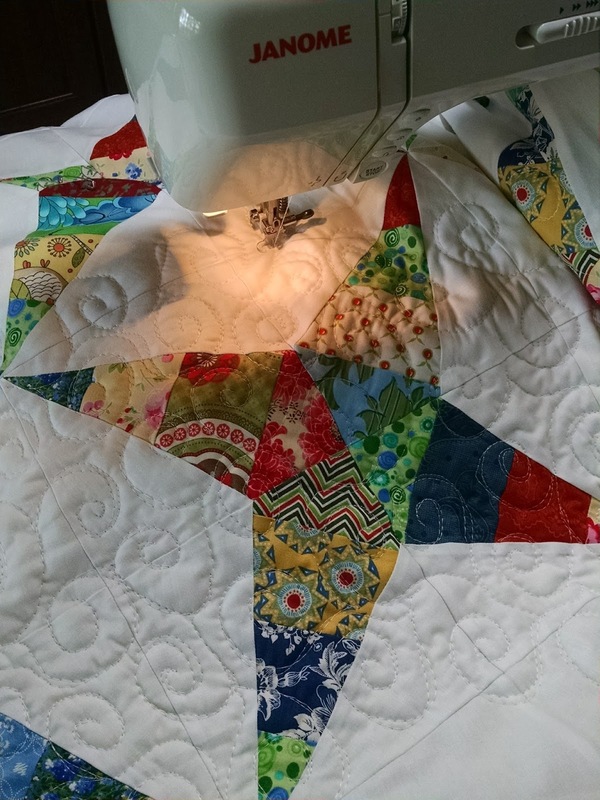 Hop on over to Quilting Jetgirl to see what everyone else is planning for 2017! This month isn't actually a month -- it's a month and a half because of the holidays. For November/December, I worked on Michelle's quilt. She requested a palette of navy, coral. teal, and purple. 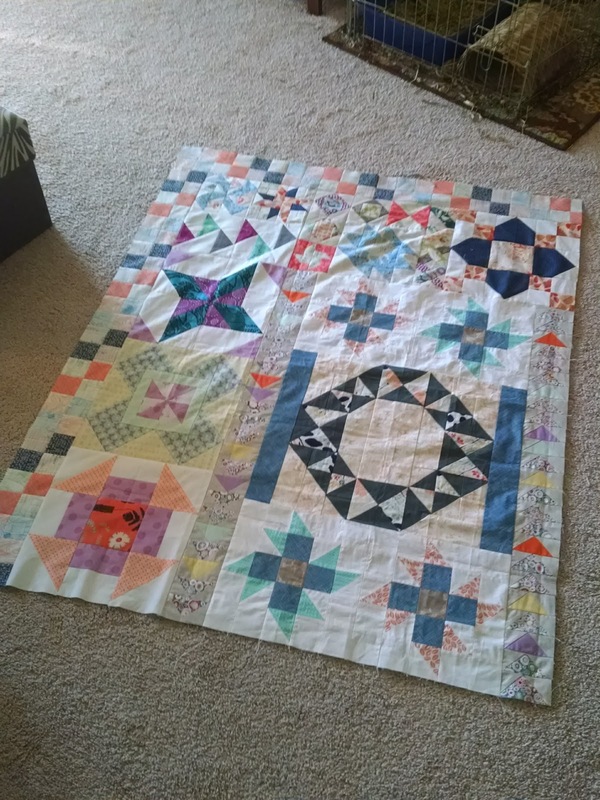 I decided to try to add on multiple sections since I had the quilt for longer. 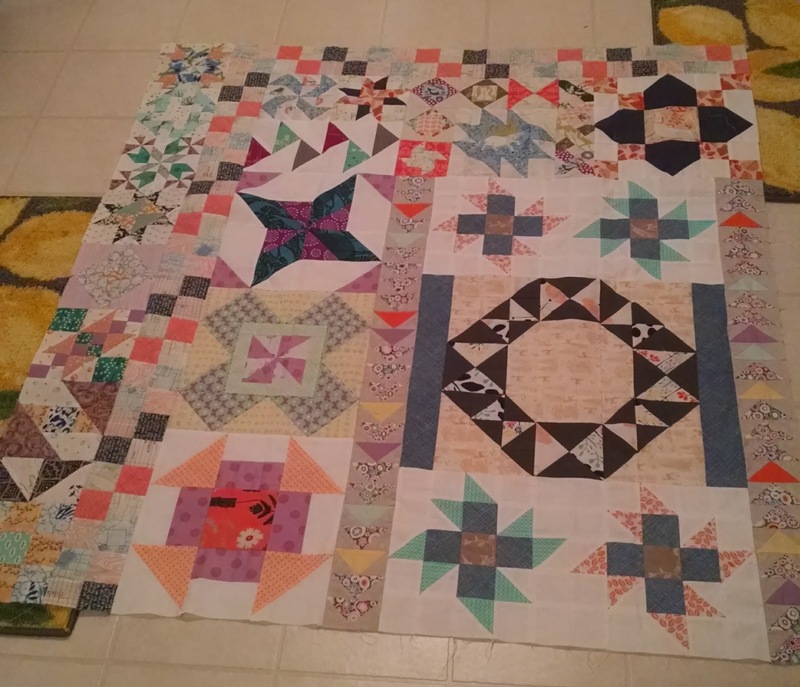 The first section I added was two sides' worth of four patches to break up the larger pieced blocks. 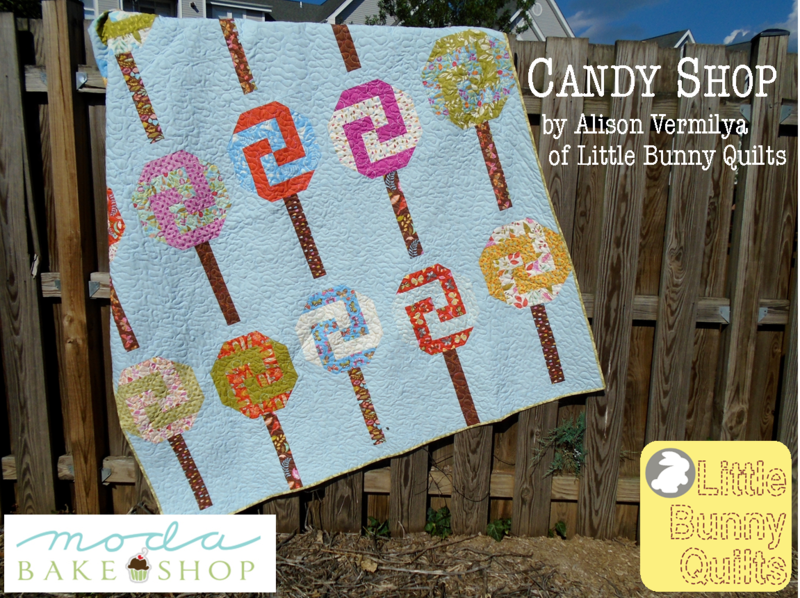 I used selected strips from an Architextures jelly roll that fit her color scheme. Neither edge came out perfectly "square" with an even number of four patches, but it still looks good to me. Next, I decided that I would make a strip of 6 inch blocks along one of the long sides of the quilt top. I used a bunch of my favorite patterns from the Farmer's Wife blocks and added two 3 inch blocks to get it to the right length. As of right now this quilt is approximately 54 x 51 inches. I kept toying with the idea of adding a third section , but ultimately decided against it when I had finished making my 6 inch blocks and just didn't feel like I had enough of the right colors to make a whole additional section. Instead, I went through my pile of abandoned bee blocks and sent off six 12 inch blocks for Michelle to add if she likes them! My quilt continues to grow rapidly! Nela had my quilt in November/December, which I was very excited about because she and I had been in the Stash Bee together! Here is what it looked like when she sent it off to its last stop! She added the row of HST blocks at the bottom of the quilt in this picture. As of right now, it is 54 inches wide and 67 inches long! One more row on each side of the quilt, and this thing will be nearly twin sized! Sharing at Let's Bee Social and NTT Thursday! PS. I have an end-of-year goal to be the 800th most popular DIY and Crafts blog on Bloglovin. I am currently 820th, so I am SO CLOSE to my goal. 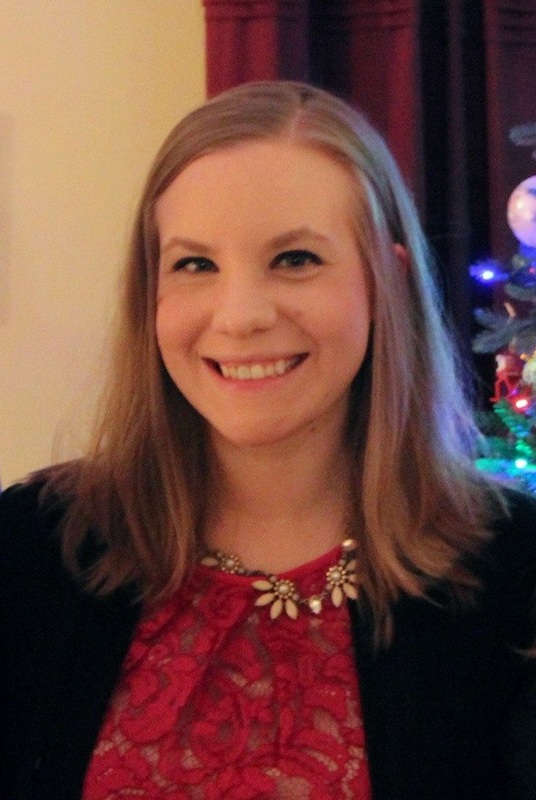 If you don't follow me in some other method already, please consider following me on Bloglovin! Hi, my name is Alison and I have a WIP problem. As excited as I am to start using my Quilter's Planner in 2017, I am not excited to actually put all of my current WIPs into it. I wrote down the list of the WIPs that haven't actually been finished in the time since we moved to Maryland (2.5 years ago!). The list is long and embarrassing so I figured the best way to deal with it is to put it here on the blog. I am going to attempt to get through at least a few of these between now and January 1st, but some of them I've included are QALs and Bees that won't necessarily be able to be finished right away. I've included them just so that I can keep track of all of my projects. I also guarantee there are things I am missing on this list, that will hopefully be added the next time I update this list. Status: The blocks are all done. I need to sash them together and finish the quilt top. I'd like to have the top completed before the end of the year. Status: I am up to date on this QAL. It lives neatly in its project bin. Status: I am going to be adding more blocks to this project this year in the Stash Bee. This project is effectively in a holding pattern until it is my turn to be Queen Bee in June. Status: Unless I want to add additional blocks to the current quilt that I have, this can be mailed to the next person. I will have the next quilt from mid-December to the end of January, and then get my quilt back at the beginning of February. 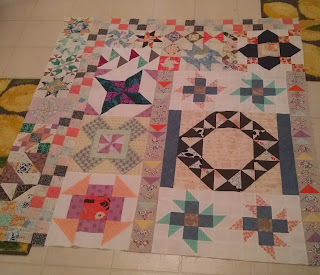 At that point, I'll have to determine how much more quilt I want to add to my top. Status: Not started? I need to make my center and mail it around December 26th. I have my fabrics/color scheme settled on (a layer cake of April Showers) but I am not sure what to use as my medallion center. Thoughts welcomed and appreciated. Status: This quilt top is completely finished so it just needs to be quilted! I think that I could reasonably finish this before the end of the year. Status: I am planning on sending this out to get pantographed. This is supposed to be a baby quilt, but there isn't a baby yet on my list for this one. Status: This thing is partially FMQ-ed just sitting on a shelf. I got frustrated coming up with different FMQ designs, but I think I just need to bust it out and finish it up. This could potentially be finished before the end of the year. Status: June hasn't been started. July needs to be satin stitched and quilted. September needs to be appliqued, satin stitched, and quilted. I also need to buy more fusible web. This project is not a priority and probably won't be worked on until some of these other bigger projects are finished. Status: this quilt top has been sitting essentially finished for a year. I want to spiral quilt it but I am intimidated by the process. Any advice and tips on this would be appreciated. Not a quilt I plan on trying to finish this year. Status: I bought/downloaded all three sets of kitchen-themed blocks from Quiet Play. I have one set fully complete, and then started on the second set. These blocks are good for a paper piecing fix and not a priority for finishing any time soon. Status: The center of this quilt is complete as well as the first three borders. The next border is all paper pieced square in a square blocks. I need to print out like 100 foundations and just get cracking. This isn't necessarily a priority but it isn't one I want to have languishing forever either. Status: The backgrounds are done for a few of them, but since I changed jobs, I don't really have a place to hang them in my new cubicle. On indefinite hold, unfortunately. Status: I haven't worked on these in ages. These are a good scrappy project, but again, not a priority with all of the other things I have been working on. Status: Plugging away at making HSTs. It's a leader and ender project so I don't forsee it moving very quickly (or needing to move quickly) unless I find out I need a baby quilt for a girl soon. Status: I gave some of these away, but I plan on making some of them into a table runner and other ones into another baby quilt with the addition of a few more blocks. Not a priority at this time, but good to have as an option if I want a smaller project to work on. Status: I have seven blocks done and five to go (January, July, September, October, December). 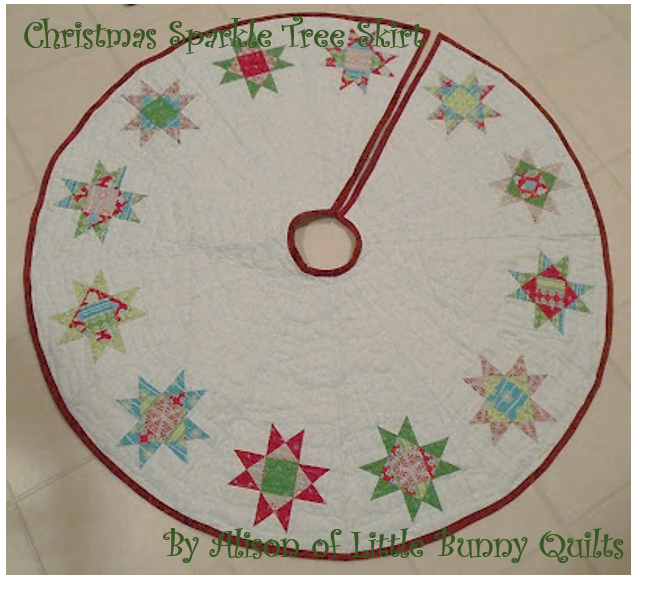 This is another project for when I need a paper piecing fix. Status: I bought four patterns during May is for Makers last year and my idea was to do one pattern each quarter in 2017. With all of these WIPs, I think that I might not allow myself to start one until I cut through about a quarter of this list, which I think could be possible. Status: As noted above, I really can't justify starting anything new until some of these things are completed and/or I get to stopping points on a huge portion of them. I have fabric set aside for a Double Wedding Ring quilt. I also have some other fat quarter bundles that I have won/purchased that are just waiting for projects as well. Status: I guarantee that there are older projects and orphan blocks that I have forgotten about. Once I get a good chunk of these things scratched off the list, I am going to sort and reorganize my sewing storage to try to see what else might be lingering in my stash. These 5 projects plus my leader and ender project are totally reasonable to complete by the end of December. How long are your WIP lists? Did I scare anyone? How do you keep focus on a smaller number of projects? My December Meadow Mystery QAL blocks were quick and easy to put together since we were just making 9 blocks out of the units we had made in the previous months. Much less trimming than previous months, too! There are still lots of pieces and units that we haven't sewn at all or haven't sewn into blocks just yet! We had previously made block #6 in September, so we will find out soon (hopefully!) what is in store for blocks #2 and #5. The blocks we made this month didn't use any of our fabric A (my magenta ziggy stripe) or our fabric D (my purple floral), so I'm guessing those might make an appearance again in January! Don't forget to enter my Sparkle Giveaway! Deck the Halls Blog Hop and Giveaway! 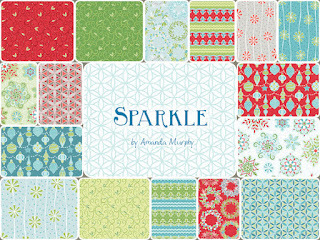 I am back at Benartex's blog, Sew In Love With Fabric, to share another fun holiday tutorial using Amanda Murphy's Sparkle line for their Deck the Halls hop! 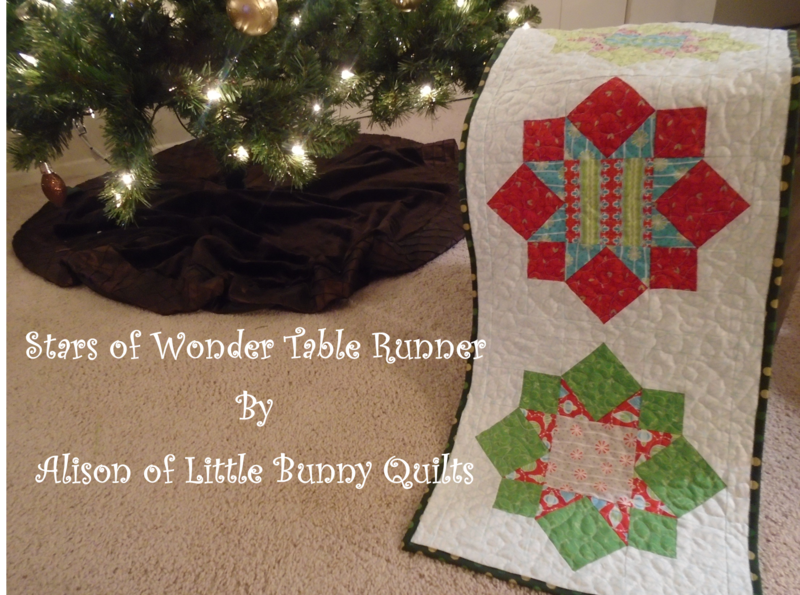 Today I'm sharing a fun table runner pattern! I love how perfectly festive it is! 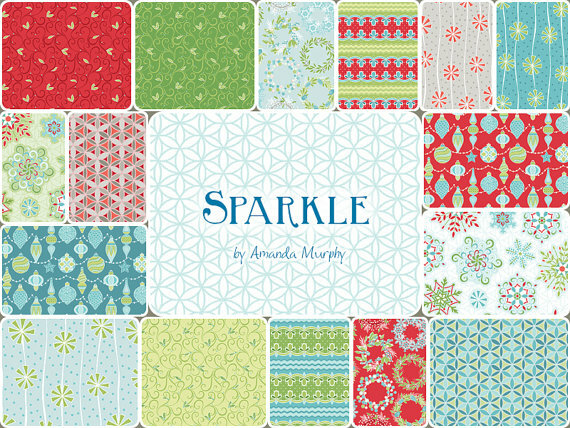 Here's your chance to win a mini bundle of Amanda Murphy's Sparkle line! 1. Leave a comment with your favorite Christmas fabric line -- old or new! 2. Followers get a second entry -- just tell me how you follow. I'm also linking up this post to Sew Mama Sew's Giveaway Day! Please hop over and visit all of the other blogs hosting giveaways! Also sharing at Needle and Thread Thursday and Finish it Up Friday! The contest is now closed! Our winner is Danette! Do you ever see a new quilt pattern and think for a second and then immediately decide that you have to make it? 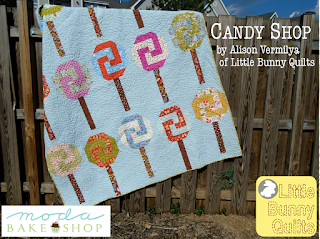 It happens to me once in a while and it happened over the summer with Melissa Corry's Top Spin pattern on Moda Bake Shop. I decided to convert this into a leaders and enders project. For those of you unfamiliar with leaders and enders, Bonnie Hunter has written multiple books based around leaders and enders projects, and has a good explanation of the process on her blog. To start off, I pulled a three yard cut of a floral hydrangea and leaf print that has been languishing in my stash as my inspiration/backing fabric. I pulled out all of my green, pink, and purple scraps from my color-sorted scrap boxes and cut as many squares in the various sizes as I could. This pattern calls for 6", 5", and 4" colored squares. While what I've started off with won't get me anywhere close to a full quilt, it's at least a starting point for this quilt. For now my plan is to start sewing all of the half square triangle units with what I have cut, start assembling blocks with the units I have, and then keep repeating the process until I get the size quilt that I want. I'm planning to make a baby sized or throw quilt rather than a bed sized quilt. Your choice of L&E project really makes an impact on how easy it is to work L&E into your normal sewing. For me, I'm just making HSTs, and having my squares pre-paired next to my sewing machine has made it much faster and easier. I'm still finding myself falling into the habit of cutting my threads as normal sometimes, but any little bit of thread saving does help. It's becoming more and more natural. I'm actually not sewing both sides of my HSTs at once -- I do one side at a time so I am not going through units quite as fast. For a scrappy quilt, it has become obvious what colors I need to add in each size. I have a ton of purple in all three sizes, a fair amount of pink in each size, and a lot of green in the smallest size, while having none/hardly any in the large and medium sizes. I will likely comb through my larger scraps and cut a lot more green and some additional pink squares. This is most certainly what I would call a "controlled scrappy" quilt in that it has a specific color scheme and there were pinks, purples, and greens that I chose not to use in this quilt. I haven't decided yet if I will cut into my inspiration fabric or not -- I have three yards of it, but that could cover nearly all of the back and the binding for a small quilt. While cutting all of my squares, I pulled out one color at a time from my scrap boxes and then sorted out any pieces that were too small or the wrong color. With what was left, I ironed each piece and laid it out on my cutting board to get an idea of the size and tried to maximize how many squares I could cut. Typically, this involved cutting 6 inch squares, then 5 inch squares, then finally 4 inch squares. Sometimes I could cut just 4 inch squares from a piece, some pieces I cut multiple 6 inch squares. I didn't try to cut an equal number of squares in each size, I just tried to maximize how many squares total I was cutting and minimizing waste. I find it is almost always helpful to cut a fresh edge when pulling things from your scrap bin. Even if it is a 1/16th of an inch, a nice fresh edge is always easier to align with your ruler. I usually sew with cone thread but I usually have a "bobbin cone" so I don't have to unthread and rethread my needle and machine. I do my best to fill a few bobbins at a time so I don't need to stop mid-project. When sewing scrappy, I often use off-white thread. Have you worked with leaders and enders before? Do you have any tips for me? Sharing at Tips and Tutorials Tuesday, Let's Bee Social, and Scraptastic Tuesday!